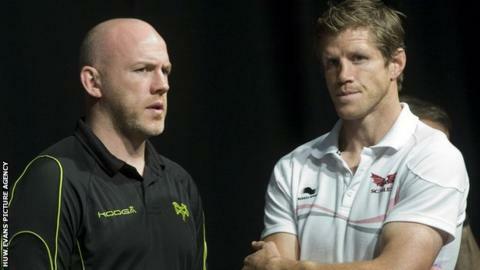 Scarlets coach Simon Easterby hopes young coaches at the Welsh regions are given time to be successful. Easterby, 37, took over in the summer following the departure of Nigel Davies to Gloucester. And 32-year-old Steve Tandy is in his first full season at the helm with the Ospreys. "The Ospreys and the Scarlets [have] shown faith in some young coaching groups and hopefully that will pay off in the future," Easterby said. Tandy was appointed Ospreys head coach following the departures of Sean Holley and Scott Johnson and led them to victory in last season's Pro12 Grand Final. The Ospreys are the only Welsh side to have won in the Heineken Cup so far this season and are sixth in the Pro12. Easterby's Scarlets are second in the league but lost their two opening games of the Heineken Cup and the head coach says supporters need to be patient. "I'm not saying it's going to happen overnight and were going to win European Cups for next three or four years," added former Ireland flanker Easterby. "But I think Steve showed it last year. He took over from Scott Johnson and he made his mark by winning the Pro12. "That was great statement and a great positive for young coaching." "There's always going to be question marks over our experience, myself and Steve in particular as head coaches. "But unless we get this opportunity we can't get that experience. You've just got balance that up." Easterby hopes the Welsh Rugby Union will help the regions keep their best players in Wales for the benefit of the game at International and regional level. WRU chief executive Roger Lewis recently revealed the regions turned down an offer to contract their Welsh international players centrally. "We want to keep the likes of George North in Wales, we want to keep Jon Davies in Wales," added Easterby. "Hopefully the Union see that the way forward is to try and keep these players playing in Wales for the benefit of the national team and the regional game. "What they can earn in France is astronomical and they can be life changing sums of money. But hopefully they can also be well compensated by playing in Wales. "Wales doesn't have that many top quality players and we need to keep hold of the best we can and to play in the regions to make them as strong as possible. "Otherwise we are going to struggle to compete against the best. "We have to be realistic that were not going to compete financially with teams but it doesn't mean we can't compete with them on the playing pitch. "It's probably that consistency and keeping that squad together that's important."